Denver’s second Biennial of the America’s is a festival of ideas, arts and culture meant to examine issues impacting life in the Americas. Among the artists tapped to be part of this year's event is Xi Zhang. With the Biennial of the America's underway in Denver, Carrie Saldo chats with up-and-coming painter Xi Zhang who was selected to take part in this year's event. Painter Xi Zhang was on the national stage in 2011 when his work was used to help the nation reflect on the 10th anniversary of the Sept. 11 attacks. Now, Xi’s work will be seen by another international audience – those gathering in the city for the Biennial. “Xi’s is a perfect example of an artist who comes from abroad, makes Denver his home and creates new work that really captures that duality of cultures,” said Tariana Navas-Nieves, Manager for Cultural Programs at Arts and Venues Denver. Facebook, Twitter, video games, advertisements, and internet searches All part and parcel of modernity. 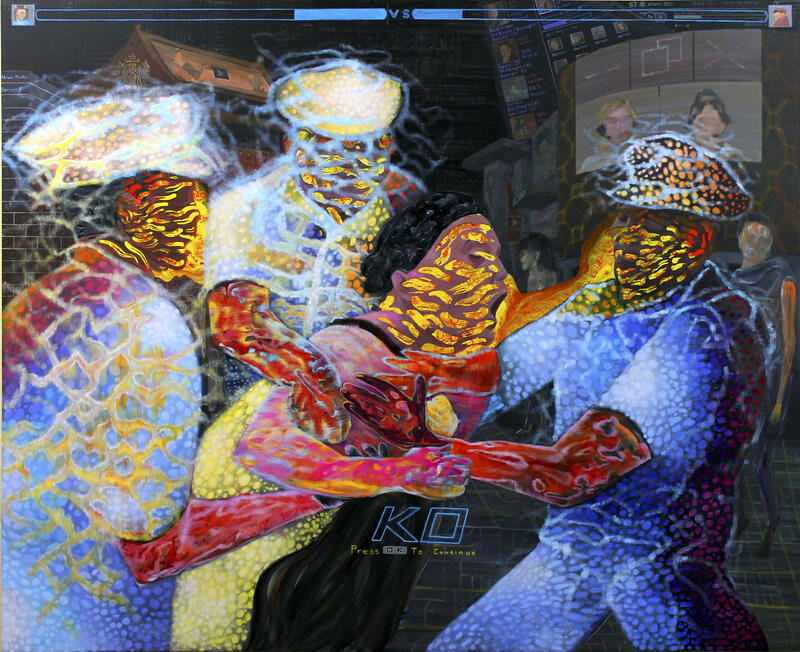 Painter Xi regards all that digital material as more than necessary, he believes, regardless of race, it has become intertwined into humanity. He calls it 21st Century DNA,” which is also the title of the exhibit. A native of China, the 28-year-old Xi moved to the United States almost a decade ago. His paintings sit at the intersection of technology, culture, and society. Some are humorous, some epic, and some controversial. Xi’s work often blurs the lines of the digital and physical worlds. Cellphone self-portraits (commonly referred to as selfies), Angry Birds, and hyperlinks are just a few of the contemporary technological items integrated into the paintings. 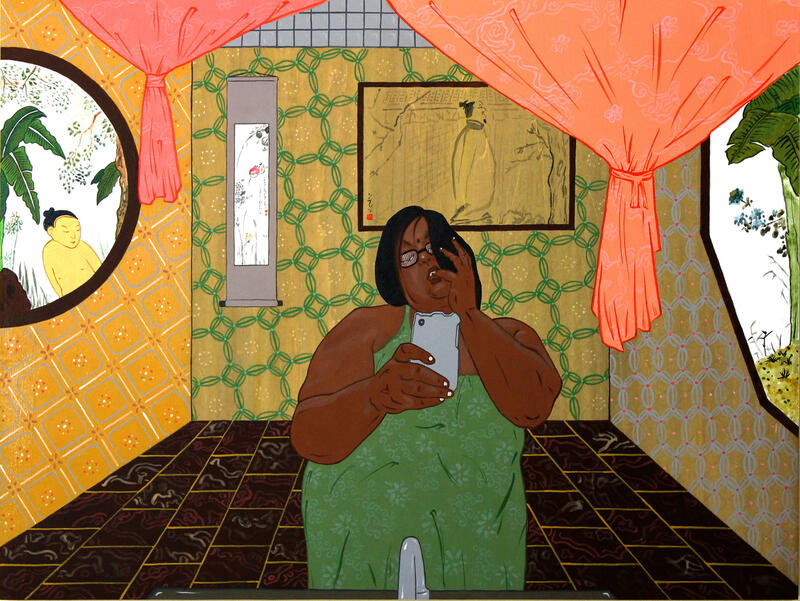 One of a series of paintings created by Xi Zhang that riff on the cell phone "selfie" phenomenon. Xi has degrees from the Rocky Mountain College of Art + Design and the University of Colorado at Boulder. The work he created as a student caught the attention of gallery owner Ivar Zeile, whose Plus Gallery represents him. “The daringness, the uniqueness. Coming from a student his age, this was absolutely breath-taking, brilliant work,” said Zeile. Zhang has the eye of those on the other side of the art world too. Since 2008 Xi’s work has received a shout out at least three times by Denver Post Art Critic Kyle Macmillian.He has named Xi “Emerging Artist of the Year,” one of the“12 Best Artists Under 35” and a Pathfinder in the Arts. Xi Zhang: 21st Century DNA, runs through July 29 at the McNichols Civic Center Building. Arts District is a collaboration between KUNC, RMPBS, and KUVO. In an age of brevity, Garrison Keillor is a man who isn’t afraid to deploy a comma (or 21) to construct a point. Denver’s Botanic Gardens is already well-known for a vast diversity of color and flora. Now something inorganic is dotting that landscape: Sculpture. Hearts pounded and energy was high at the Denver Art Museum’s performance of Nick Cave’s Soundsuits. It was all part of the DAM’s ongoing mixed-media Untitled events.